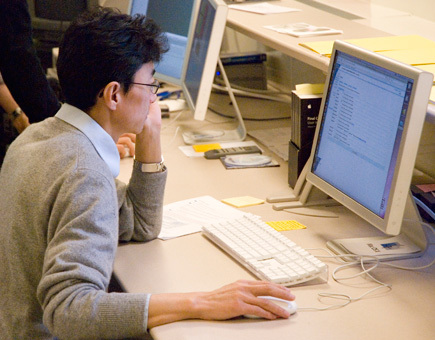 The Faculty Support Lab, located in 204 Butler Library on Columbia's Morningside campus, was created to support instructors using and learning how to use new media to enhance education at Columbia. You will find a CCNMTL staff person is always available for consultation, guidance, and technical assistance. The lab is equipped with a SmartBoard and 11 computer stations with a full range of software applications, as well as scanners and audio/video equipment. Email or call the CCNMTL Faculty Lab at ccnmtl@columbia.edu or 212.854.9058. The Faculty Support Lab, located in 204 Butler Library, is open Monday-Friday 9am-5pm. An educational technologist is always available for individual consultations.